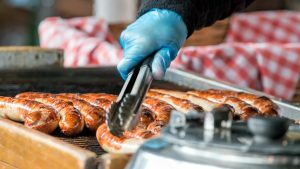 Sports organizations face liability risks from food poisoning incidents resulting from improper food handling at concession stands. These incidents should be covered by General Liability insurance. However, they should be prevented before they ever get to that point. Here are some tips for reducing the risk. Management should have centralized control and supervision of all aspects of food handling and preparation from start to finish at a single location. Avoid at home food preparation except for baked goods such as brownies, cupcakes, and cookies. All food handlers should receive training by management prior to service. Plan menu ahead to avoid serving higher risk foods to the greatest extent possible such as meats, poultry, eggs, dairy products, and cut fruits and vegetables. All local food licensing and permit laws and regulations must be followed. All food must be purchased from quality sources. Never purchase or serve food past its expiration date. Never buy food that is not in excellent condition: refrigerated food must be cold to touch, frozen food must be hard, food must not have a odor that is indicative of spoilage, and all cans must be free of cracks, dents, and bulges. 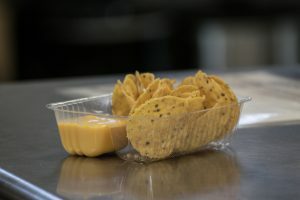 When purchasing food from grocery store, purchase cold food last and quickly deliver to concession stand and keep cool while in transit to reduce bacterial growth. Consider packing meats, poultry, fish, salads, and perishables in a cooler with ice. Food handlers should thoroughly wash hands for 30 seconds with soap and warm water after potential contamination events. Potential contamination events include going to bathroom, sneezing or coughing, touching face, eating or taking a break, touching contaminated surfaces or utensils, touching uncooked meat, touching cash register, answering phone, dumping the garbage, touching pets, changing diapers, etc. Gloves are recommended as an additional barrier but don’t take the place of frequent hand washings. Gloves should be changed at every hand washing and when they are soiled or contaminated. Use of hand sanitizers can supplement hand washings. Food handlers must not have symptoms of disease (coughing, sneezing, sniffling, fever, nauseated, vomiting, diarrhea, etc.) or open wounds when handling food. Proper clothing includes clean outer garments and hats / hairnets. Food handlers should not touch ready to eat foods with bare hands and should instead use an appropriate utensil, gloves, or deli paper. Always use a scooper instead of bare hands to dispense ice for drinks. Insects and vermin such as flies, cockroaches, rats, and mice can transmit disease when they come in contact with food. Flies that land in feces and then land on food can also transmit disease even though this is not common. All food should be stored off the floor. All unused food should be disposed of both during the event and after the event to eliminate unwanted pests. Food preparation surfaces should be constantly cleaned and wiped down to discourage insects. Keep food covered to protect against insects. Keep a tight lid on the trash to keep out insects. Dispose of wastewater in an approved method instead of dumping outside the concession stand. Store pesticides away from foods. Foods that require refrigeration must be cooled and held to 40 degrees F or lower until ready to serve. Use a thermometer in your refrigerator and freezer and make sure that your freezer runs at 40 degrees F and your freezer at 0 degrees F.
Quick cooling involves the use of an ice bath (60% ice, 40% water) or the use of shallow refrigeration trays no more than 4 inches in depth. Always marinate meats, poultry, and fish in a refrigerator and not on a counter. Always thaw food in the refrigerator or microwave prior to cooking. Otherwise, the outer layers are subject to bacterial growth before the inside thaws. All potentially hazardous foods should be properly cooked and held at an internal temperature of 140 degrees F and above. When cooking meats, you can’t rely on the color of the meat as an accurate gauge of temperature. Always use an “instant read” food thermometer to determine the temperature of foods for cooking and holding temperatures. When cooking, use thermometer in thickest part of meat. Be sure to wash thermometer with hot, soapy water between uses. If meats and poultry are completely cooked ahead of time and then chilled, its OK to put them on grill for re heating. Microwaves often leave cold spots in hazardous foods where bacteria can survive. Cover hazardous foods with a lid or plastic wrap so that steam can be retained to assist in cooking. Stir and rotate for even cooking. Always observe the standing time on microwave directions as food finishes cooking during this time. Use an “instant read” food thermometer and make sure food is heated appropriately to USDA recommendations. Quickly reheat potentially hazardous foods to 165 degrees F.
Avoid using show cook devices such as crock pots or steam tables as they may activate bacteria and may never reach 165 degrees F.
Disposable knives, forks, spoons, plates, and napkins should be used to cut down on cleaning and contamination. Disposable products should not be cleaned and re used. Always use plastic cutting boards instead of wood cutting boards, as wood cutting boards tend to hold bacteria. Use disposable utensils for food service whenever possible. When washing pots, platters, containers, utensils, etc. always use the four-stage process of washing in hot soapy water, rinsing in clean water, chemical or heat sanitizing, and air-drying. Frequently sanitize and wipe down all food preparation surfaces, refrigerators, freezers, coolers, and other concession equipment. Wiping cloths should be stored in chemical solution buckets with an appropriate ratio of bleach to water such as 1/2 teaspoon to one gallon of water. Frequently wash and replace all sponges, towels, wiping cloths. Frequently dump garbage and sweep or vacuum floors. Never use unclean food preparation utensils for serving food. Place raw meat, poultry, or fish on a plate before refrigerating to make sure that juices don’t leak and contaminate other food. Never commingle ice to cool drinks with ice to be served. Stadium Foods Present Unique Food Safety Risks: Part 1 And Part II; April 19, 2010, Richard J. Arsenault. Food Safety Hints for Non-Profit Organizations And Schools; Fort Wayne-Allen County Department Of Health, Ft. Wayne, Indiana. A Quick Consumer Guide to Safe Food Handling; University Of Minnesota; Feb. 4, 2009. Parts Adapted From Your Safe Food Handbook, USDA, Feb. 2008.